1Departamento de Biología, Facultad de Química y Biología, Universidad de Santiago de Chile (USACH), Alameda 3363, Estación Central, 9170022 Santiago, Chile. 2Departamento de Química, Facultad de Ciencias, Universidad de Chile, Las Palmeras 3425, Ñuñoa, Santiago, Chile. Pectinase enzymes catalyze the breakdown of pectin, a key component of the plant cell wall. At industrial level, pectinases are used in diverse applications, especially in food-processing industry. Currently, most of the industrial pectinases have optimal activity at mesophilic temperatures. On the contrary, very little is known about the pectinolytic activities from organisms from cold climates such as Antarctica. In this work, 27 filamentous fungi isolated from marine sponges collected in King George Island, Antarctica, were screened as new source of cold-active pectinases. In semi-quantitative plate assays, 8 out 27 of these isolates showed pectinolytic activities at 15 °C and one of them, Geomyces sp. strain F09-T3-2, showed the highest production of pectinases in liquid medium containing pectin as sole carbon source. More interesting, Geomyces sp. F09-T3-2 showed optimal pectinolytic activity at 30 °C, 10 °C under the temperature of currently available commercial mesophilic pectinases. Filamentous fungi associated with Antarctic marine sponges are a promising source of pectinolytic activity. In particular, pectinases from Geomyces sp. F09-T3-2 may be potentially suitable for biotechnological applications needing cold-active pectinases. To the best of our knowledge, this is the first report describing the production of pectinolytic activity from filamentous fungi from any environment in Antarctica. Among the macromolecules that compose the plant cell wall, pectin is one of the most abundant and complex. Pectin is a family of diverse polysaccharides that comprise, at least, seven structural elements, being homogalacturonan, xylogalacturonan, rhamnogalacturonan I and rhamnogalacturonan II the most widely known [1, 2]. From a chemical point of view, pectin is composed by a main chain of galacturonic acid residues bound by β (1 → 4) linkages (homogalacturonan), or by a mix of galacturonic acid and rhamnose (rhamnogalacturonans) or galacturonic acid and xylose (xylogalacturonan). In turn, the main chain can be substituted by a variety of molecules, such as methyl, ethyl, and diverse sugar moieties (arabinose, rhamnose, galactose, and others) . According to its complex structure, biodegradation of pectin requires a pool of several enzymes, collectively named as pectinases. These pectinases include pectin methyl esterases, pectin acetyl esterases, polygalacturonases, polymethylgalacturonases, polygalacturonate lyases, polymethylgalacturonate lyases, rhamnogalacturonase, arabinases and xylogalacturonases . Pectinases have great biotechnological potential, mainly in the food industry. Pectinases are used to remove the suspended pectin from raw juices in fruit juices processing, thus avoiding the increased viscosity that inabilities the filtering process. In winemaking, in addition to the improvement of mash filtering, pectinases can be also used to improve the juice extraction from the grapes and to release compounds responsible for the color and aroma in wines [4, 5]. Among the microorganisms able to degrade pectin, the filamentous fungi are among the most efficient. They have demonstrated a great capability of secreting a wide range of pectin-degrading enzymes, and currently, most of the commercial pectinolytic enzymes available are produced by filamentous fungi, particularly from genera Aspergillus, Trichoderma and Penicillium [1, 6, 7]. By far, most of the commercial pectinases are of mesophilic origin, and they account up to 40% of the enzymes used in food industry . These mesophilic commercial pectinases have optimal temperatures between 40 and 60 °C . However, there are processes where pectin degradation is necessary at lower temperatures. For example, the clarification of the mash for the production of white wine and pisco is performed at 15 °C. This low temperature is required to avoid the propagation of microbiota and to keep intact the aromatic molecules, which confer the organoleptic characteristics to these products. Recent investigations indicate that commercial pectinases with mesophilic characteristics do not work efficiently during wine fermentations at low temperatures . Thus, in the last years the interest to seek cold-active pectinases (with optimal temperatures below 40 °C) is increasing. These cold-active pectinases potentially could replace the existing mesophilic commercial enzymes in low-temperature processes. Microorganisms isolated from cold regions of the Earth are able to produce cold-active pectinases, and to date, several yeasts and some bacteria with this ability have been isolated from samples of Argentinian Patagonia, Himalayan regions, Iceland and Japan . On the contrary, the information about filamentous fungi producing cold-active pectinases is rather scarce. Although in literature there are several papers claiming for the production of cold-active pectinases or cold-active pectinolytic activities by filamentous fungi (both from mesophilic and cold-loving fungi), almost all of them report the production of pectinolytic enzymes with optimal activities at 40-45 °C [9-14]. Thus, to the best of our knowledge, pectinases from filamentous fungi with optimal activity lower than 40 °C have been identified only in Botrytis cinerea . Antartica is one of the most pristine, remote and cold regions in the Earth. Thus, this place seems suitable for the prospection of new microorganisms producing cold-active enzymes, including pectinases. Bacteria and yeasts able to degrade pectin have been isolated from different Antarctic environments [16-19], but remarkably, to the best of our knowledge, there are no studies reporting the successful production of cold-active pectinases from filamentous fungi isolated from any environment in Antarctica. Recently, we have obtained cultivable filamentous fungi from Antarctic marine sponge samples . We hypothesize that these fungi could be producers of cold-active enzymes, including pectinolytic activity. Therefore, the objective of this study was to evaluate if these Antarctic filamentous fungi can produce cold-active pectinases. The fungal strains used in this work are described in Table 1. All of them were previously obtained from Antarctic marine sponges  and belong mostly to Geomyces sp. and Pseudogymnoascus sp., which are recognized cold-loving organisms . Most of them are unidentified species (see “Discussion”). All the fungal strains were routinely kept on potato dextrose agar (PDA) until use. In preliminary experiments, we observed that fungi associated with Antarctic marine sponges have optimal temperature for growth at 15 °C (data not shown), so we used this temperature in all the experiments. At that temperature, pectinolytic activity was screened upon inoculation of fungal isolates on agar plates containing Czapek-agar plus pectin as the sole carbon source (NaNO3 10 g/L, K2HPO4 2 g/L; MgSO4·7 H2O 0.5 g/L, FeSO4·7H2O 0.01 g/L, pectin from citrus peel (Sigma) 10 g/L, agar-agar 2%; pH adjusted at 5.5 with NaOH). Fungi were grown during 7 days in triplicate, and pectinolytic activity was determined by staining the plates with 1% cetyltrimethyl ammonium bromide (CTAB) solution. CTAB has the ability to precipitate acid polysaccharides in solution, so it is commonly used to detect pectinolytic activity on agar plates [22-24]. Briefly, 5 mL of CTAB solution was added to each plate and incubated during 30 min. After that, excess of CTAB solution was eliminated, and the enzymatic activity index (EAI) was calculated as the halo/colony diameter (h/c) ratio according to de García et al. . EAI is a semi-quantitative parameter commonly used to quickly estimate the enzymatic activity of microorganisms grown on solid media [26, 27]. Flasks containing 100 mL of liquid Czapek-pectin medium (the same composition as above, without agar-agar) were inoculated with 1 × 107 spores, and incubated at 15 °C and 180 r.p.m. during 10 days. Supernatant samples were withdrawn daily, and pectinolytic activity was measured as described below. For pectinase activity measurement, each reaction mix contained 200 μL sodium acetate buffer 500 mM pH 5.5, 200 μL pectin solution [pectin from citrus peel (Sigma) 0.5%, pH 5.5] and 25 μL of the suitable supernatant sample. The reaction mix was incubated during 30 min at 37 °C. Reaction was stopped by addition of 640 μL of dinitrosalicylic acid solution (dinitrosalicylic acid 1%, sodium potassium tartrate 30% and NaOH 1.6%) and incubation at 95 °C for 5 min. At these conditions, dinitrosalicylic acid reacts with the reducing sugar released from pectin, producing a complex with maximal absorbance at 540 nm. Thus, the reaction was then cooled in ice by 5 min, and centrifuged to obtain the supernatant. Absorbance of the supernatant was measured at 540 nm, and absorbance data were interpolated in a suitable calibration plot. The pectinolytic activity (U/mL) was calculated as the enzyme necessary to release 1 μmol of reducing sugars for minute. Specific activity (U/mg) was obtained normalizing the activity by protein concentration, determined by the Bradford's method . To determinate the effect of temperature on pectinolytic activity, the same assay described above was performed, but at different temperatures. For details of temperatures used, see the respective Figure. Nineteen out 27 strains grew on Czapek-pectin medium, but did not show halo of degradation in the plate assay at 15 °C (data not shown), suggesting that they have poor pectinolytic activity at low temperature. The rest of the isolates (eight fungi) showed different degree of intensity of the pectinolytic activity by the halo/colony ratio (Fig. 1). All these fungi had similar behavior, with EAI around 1.5-2.0 (Fig. 1). 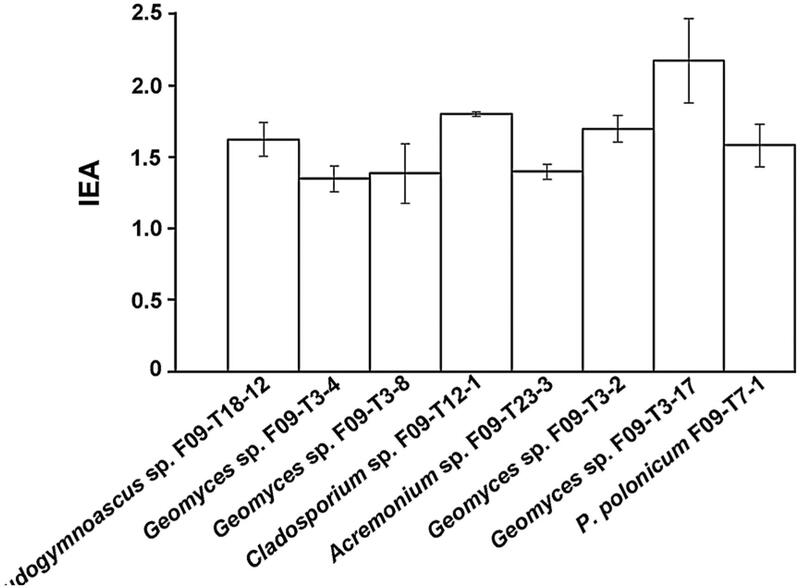 These eight fungi were used to estimate their production of pectinolytic activity in liquid medium (see below). The eight fungi showed in Fig. 1 were used to quantitatively estimate the production of pectinolytic activity in liquid medium at 15 °C during 10 days. By far, the strain Geomyces sp. F09-T3-2 produced the highest levels of pectinolytic activity. At day 5, this strain produced maximal specific activity (121 U/mg; Fig. 2). The rest of the strains tested produced barely detectable activity compared with this strain (data not shown), so they were discarded for further experiments. Differences in activities observed between plate assays and measurements in liquid medium can be explained by different conditions used in these assays. Plate assays are semi-quantitative and give a rough idea of the potential of the fungi as producers of cold-adapted pectinases. The assay takes 7 days, and during this time, pectinases secreted diffuse through the agar gel, degrading pectin. Thus, the result observed in plate assay corresponds to enzymes acting on pectin during several days. On the contrary, the measurement of specific activity is performed in liquid medium, and compared to plate assay, it takes a very short time (30 min). The differences can be also explained by the sensitivity of the assays. In plate assay, similar halos can be produced by few but highly active enzymes, or by much enzyme with low activity. On the contrary, specific activity can discriminate both situations. Thus, two fungi can give similar patterns in plate assay, but their specific activities can be very different because different enzymatic conversion rates, or differences in the total protein produced by each fungus. We tested the performance of pectinolytic activity of Geomyces sp. F09-T3-2 at different temperatures (Fig. 3). We found that pectinases of this strain have a good performance at low temperatures. Our results indicate that optimal temperature for activity of pectinases from Geomyces sp. F09-T3-2 is 30 °C, which is 10 degrees lower than those observed for the commercial pectinases from mesophilic fungus (see “Discussion”). In fact, to the best of our knowledge, these results suggest that pectinases from Geomyces sp. F09-T3-2 have the lowest optimal temperature among the fungal pectinases described so far (see “Discussion”). Pectins are a heterogeneous group of polysaccharides that compose the plant cell wall. In food industry, high amounts of pectin are released during processing of fruits, which tend to remain in the suspension, resulting in an increase in viscosity and turbidity, which hampers the clarification process. This problem is usually solved by the use of pectinolytic enzymes . Commercial pectinases have optimal activity temperatures between 40 and 60 °C, but some processes (such as white wine and pisco production) occur at lower temperatures. Thus, pectinases working at lower temperatures are necessary. Here we have identified a fungal strain with optimal pectinolytic activity at 30 °C, at least 10 °C lower than most of the fungal pectinases described so far. This strain would be an ideal candidate for future purification of cold-active pectinases. To the best of our knowledge, there are no reports describing the successful production of pectinolytic activity from filamentous fungi isolated from Antarctica. Loperena et al. characterized the production of pectinolytic activity in several Antarctic fungi using a similar plate semi-quantitative analysis, but they did not found any filamentous fungi producing pectinolytic activity. On the contrary, we found eight strains (representing 30% of the Antarctic filamentous fungi analyzed in this work) producing pectinolytic activity (Fig. 1). Thus, this may be the first result demonstrating the production of pectinolytic activity in filamentous fungi from any Antarctic origin. Our strains producing pectinolytic activity includes four strains of Geomyces sp., one strain of Pseudogymnoascus sp., one strain of Acremonium sp., one strain of Cladosporium sp. and one strain of P polonicum. Pectinolytic activity has been already described in Penicillium, Cladosporium and Acremonium species [31-35], but not in Geomyces or Pseudogymnoascus species. Thus, pectinolytic activity in these fungal genera is reported here for the first time. Geomyces sp. and Pseudogymnoascus sp. are saprophytic cold-loving fungi  commonly found in cold environments including marine and terrestrial Antarctica [20, 30, 36, 37]. Geomyces sp. and Pseudogymnoascus sp. are allied (phylogenetically closer) genera whose taxonomical placement was recently re-evaluated . As a result, currently just one species of Geomyces (G. auratum) is formally recognized . Interestingly, and according to a preliminary analysis (data not shown), none of the Geomyces sp. strains that showed pectinolytic activity in Fig. 1 (including the best producer Geomyces sp. F09-T3-2) belong to G. auratum, so they would be new species waiting for a formal taxonomical description. Regarding Pseudogymnoascus sp., it is a very diverse and extent group of species, most of them undescribed yet, whose taxonomic relationships are not totally clear . The production of pectinase activity under 40 °C by filamentous fungi is rare. This is true even in psychrophilic and psychrotolerant filamentous fungi. For example, Sclerotinia borealis, a pathogenic fungus found in regions extremely cold that does not grow at temperatures higher than 20 °C, produces pectinases with optimum activity at 40 °C . Another case is Mucor flavus, a psychrotolerant fungus with optimal growth at 15 °C that produces pectinases with optimal activity at 45 °C . Thus, to the best of our knowledge, in the literature there is only one example of a filamentous fungus producing pectinases with optimum activity below 40 °C. This belongs to the phytopathogenic fungus Botrytis cinerea, which produces pectinases with optimal activities between 34 and 37 °C . 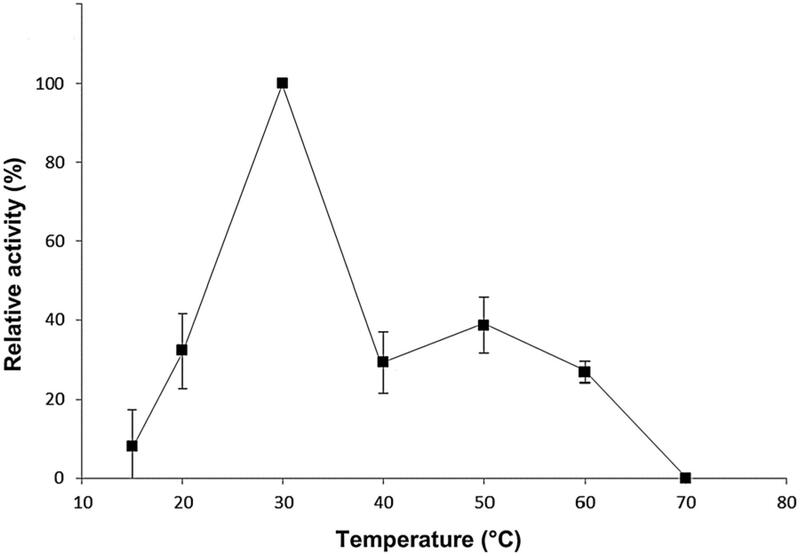 In our case, we observed that the optimal temperature of the pectinolytic activity of Geomyces sp. F09-T3-2 was 30 °C (Fig. 3). Thus, the pectinases from Geomyces sp. F09-T3-2 may have the lower optimal temperature described so far for any pectinase from filamentous fungi, making this strain a promissory candidate for the purification of cold-active pectinases with potential biotechnological applications. To the best of our knowledge, this work is the first describing the production of pectinolytic activity in any Antarctic filamentous fungi. Our results suggest that filamentous fungi associated with Antarctic marine sponges are potential producer of pectinases. In particular, the isolate Geomyces sp. F09-T3-2 showed optimal pectinolytic activity at 30 °C, the lower temperature described so far for this activity in any filamentous fungus. Thus, pectinases from this isolate may be potentially suitable for biotechnological applications such as clarification of mash for the production of white wine and pisco. This work was supported by Instituto Antártico Chileno project INACH G_06-10, Fondecyt Grant 11090192, and DICYT-USACH. CGD has received doctoral fellowship CONICYT-PFCHA/Doctorado Nacional/2014-63140056. The funders had no role in the design of the study and collection, analysis, and interpretation of data and in writing the manuscript. GP and CGD performed the experiments. IV, GL and RC conceived and designed the experiments, wrote and edited the manuscript. All authors read and approved the final manuscript.